Massachusetts Governor Charlie Baker has carefully cultivated the image of a business-minded Republican intent on running government more efficiently. 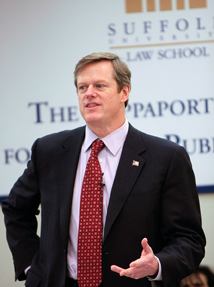 Not only did he manage to win office in liberal Massachusetts, Baker’s 71 percent approval rating is nearly the highest of any governor in the nation. But when it comes to transit, Baker’s spending priorities are not consistent with his pragmatic persona. His decisions regarding which Boston-area transit projects to fund, which to threaten with cuts, and which to ignore entirely, appear rooted in political image-making rather than economic criteria. Four proposed rail extensions tell the story. Baker has brushed off bipartisan calls to build the transformational North-South Rail Link, saying it is unaffordable. But at the same time, he supports the low-impact South Coast Rail and South Station Expansion, conventional commuter rail projects that nevertheless cost almost as much together as the North-South Rail Link. A fourth project, the Green Line Extension, is also fairly high-impact, and was funded in previous administrations, but as costs grew, Baker threatened to cancel it unless there were budget cuts. The pattern is that Baker threatens or refuses to fund projects based on how big they look, rather than their merits. The North-South Rail Link, or NSRL, is a proposed tunnel in Downtown Boston, about three miles long, connecting the city’s two train terminals, North Station and South Station. This would enable through-running trains between the South Side and North Side commuter lines, creating a modern regional rail network like the Paris RER. NSRL’s Major Investment Study from 2003 projected 327,000 commuter rail trips per weekday, up from about 130,000 today. The estimated cost is about $6-8 billion, but Democratic Congressman Seth Moulton says $2 billion would be in line with international costs of comparable projects. Despite the benefits, and the support of previous governors Mike Dukakis and Bill Weld, Baker only briefly considered NSRL before deciding against it on the grounds that it was too expensive. Fiscally conservative think tanks raised the specter of cost overruns. However, large overruns on NSRL are unlikely. NSRL was planned in the Dukakis administration to go under the I-93 Central Artery tunnel as part of the Big Dig, but was not included in the final project. However, during construction of the Central Artery tunnel, the ground immediately underneath was cleared — it’s now just dirt, with no geotechnical surprises. In other words, the work that typically triggers cost overruns for many urban rail tunnels has already been taken care of. While the region’s rail advocates know this, fiscal conservatives still assume NSRL has as much cost escalation risk as any other rail tunnel. While Baker has refused to spend $6-8 billion on NSRL, he has paid little attention to high costs of the incremental South Station Expansion and South Coast Rail projects, which combined rival NSRL’s pricetag but promise just a fraction of its benefits. South Station Expansion, or SSX, would add tracks to South Station so more trains can terminate there and sit idle at midday, at a cost of $1.6 billion. Building NSRL, which enables through-running, would certainly obviate SSX. But Baker has suggested that SSX could be built first and NSRL later, at even higher expense than doing just one of the two projects. Another project Baker seems comfortable will is South Coast Rail, or SCR — a proposed reactivation of a 45-mile commuter rail branch to Fall River and New Bedford, two deindustrialized cities about 50 miles south of Boston. The cost has increased by a factor of 13 since the line was first proposed in 1995, after adjusting for inflation, and now stands at $3.42 billion. Per mile, this is costlier than most greenfield high-speed rail lines in the world. The weekday ridership projection is only 4,600, making for a projected cost of $740,000 per rider, far higher than the normal urban rail range is $15,000-50,000 in the U.S. and $5,000-$25,000 in Europe. The limited benefits of SSX and SCR has led most Boston-area transit advocates to oppose both. But Baker seems uninterested in canceling them and diverting the money to higher priorities, even though their combined cost is close to that of NSRL. While Baker appears unbothered by SCR costs, he has threatened a far more useful project that’s undergone similar cost overruns. The Green Line Extension, or GLX, is a light rail branch that the state is mandated to build as mitigation for the Big Dig. The 4.3-mile GLX is now estimated to cost $3 billion, with 52,000 projected weekday trips. The high costs have caught the governor’s attention, and he threatened to cancel the project unless significant savings were found. The savings since identified involve scaling back useful parts of the project, : for example, to reach some station platforms, passengers would have to cross the tracks at-grade. Clearly, Baker is capable of threatening projects he considers wasteful. The question is, how does he decide what is wasteful? This is not about actual costs and benefits. It isn’t about demographics, either: NSRL would primarily help middle-class suburban commuters, many of whom voted for Baker, and the GLX is in rapidly gentrifying Somerville. Racial discrimination doesn’t explain Baker’s stance. A more likely explanation is that Baker cares deeply about appearances. He isn’t basing transit expansion policy on cost-effectiveness or budget risks, but on whether the projects look big. NSRL is a tunnel with the potential to transform the region, so it must be unaffordable. SCR and SSX are incremental projects, building on the existing paradigm of commuter rail, so they must be sensible. GLX is somewhere in between, so it can be funded provided costs are cut. “Nobody ever got fired for buying IBM,” the saying goes, and nobody gets voted out of office for building a status quo infrastructure project. While NSRL has low geological and economic risk, its political risk is high. Precisely because it is such a big change, if the state goes forward and builds it, the media will watch carefully and criticize every misstep. In contrast, low-profile investments are politically safe. The limited scope of SCR ensures that it is not a major political issue: It was originally a cheap project, and the political system still thinks of it as one, so the cost overruns have not led to scandal. SSX is even smaller in scope, since it doesn’t provide any visible service. GLX is again intermediate in visibility. Given high construction costs, in Boston as well as elsewhere in the U.S., states could use political executives who approach transit policy as pragmatic, no-nonsense managers. Unfortunately, leaders like Baker still end up engaging in theater: It is more important to them to be perceived as prudent than to make smart investment decisions. They manage their appearances and not the states they have been entrusted to run. pricetag but promise just a fraction of its benefits. My impression is that the specter of the Big Dig tempers the extent of political support that could potentially be had with NSRL, even if an easement was already prepared. Another solution to getting transformative, disruptive projects through is to completely downplay the operational benefits, bypass the state, and appeal strictly to the building trade unions and business interests, as Frank Rizzo did with the Philly CCCT (link), although Boston might already be too affluent to pull that off. Sometimes it feels like better ideas are sought during a particularly troubling time for a city and transit system, and worse ideas during a time of increasing ridership, when agencies just want to keep the status quo. Many large cities have more than one commuter rail downtown stations. Although Boston is smaller, it still has 3 stations, if you include Back Bay. (I’m so jealous. San Francisco barely has one commuter rail station over a mile from downtown.) Isn’t the point of commuter rail to shuttle people to/from downtown? With easy connections to local subways and the fact that Boston is compact and walkable, I really don’t see the need to connect the North and South stations. The point is, that without through running, Boston will need to massively expand South Station (costing a couple Billion $$s) to accommodate more trains idling there to serve morning and evening commuters. A large part of Boston’s dense urban core is devoted to train storage in the middle of the day. That money could be better put to use connecting the two stations, allowing more trains could serve more people in less space, freeing up downtown acres for development and allowing for commutes that are not simply suburb to downtown. Part of the problem is American thinking that “commuter rail” should only be for getting suburbanites into the city in the AM and back home at night. With through running service, commutes (and non-work trips) from Malden to Braintree, or Needham to Salem become possible. A better comparison than CalTrain would be if all BART service from the East Bay terminated at Embarcardero, so that people traveling on would have to transfer to a muni train, take it to 16th and Mission where service to Milbrae and SFO would begin. However, a Boston N/S rail link probably isn’t THAT useful unless the MBTA increases frequencies, especially during non-rush hours. Take Philadelphia for an example. Even when coming from the north, I can easily stay on the same commuter train through the tunnel all the way to an employment node on the west end of downtown, and vice versa the other way. To do the same in Boston one would have to transfer across two different subway lines from South to North Station, needlessly crowding out the subway lines while the commuter trains idle above, wastefully empty. There are also a lot of urban commuter lines, like Fairmount, that are subject to this slog as well; if the networks were connected in the manner of an S-Bahn or RER it would provide a useful express overlay to the subways. This diagram really demonstrates the network effect well. > creating a modern regional rail network like the Paris RER. You’ll need a lot more than a North-South rail link to turn Boston’s MBCR into a modern regional rail network like the Paris RER. I’m no fan of Governor Baker, but this hit piece doesn’t help your cause. Trying to condense highly detailed projects into one surface article doesn’t work. Boston is suffering from nearly $30 billion in debt from the Dukakis era. Baker is trying to reduce the debt. Moulton and other neophyte Dems are kissing the Dukakis ring. I take to heart the desire to build the NSRL, but we might want to scope it out and design it first, and have a funding plan in place. That is not only good practice, it is a necessity in a state where many people outside the Boston area deeply resent Boston-focused investments. That is part of the challenge in making the case for the statewide transportation revenue we need. And anyone paying attention to transit in Massachusetts knows that the costs of South Coast Rail and the Green Line Extension are huge issues. GLX is moving ahead with Federal and state funding, but scaled back because of costs. SCR is on a slow track while the state considers an alternative route. As for South Station Expansion, those costs are estimated. There’s no funding in place today for that, or for many other projects. It’s fare to criticize the Governor or other state leaders (we do it often), but this article is off base in a few respects. I write this as a fan of this blog. Your hometown of Paris is choking on diesel fumes, yet you decide to rip on Boston for sound fiscal management? Baker is a conservative who vowed to cut wasteful spending. Where’s the story? To be fair, Baker didn’t have transportation on his radar at the beginning. His first transportation pick wasn’t available, so he decided to make the DOT job a patronage position. The slot is filled with the wife of a major donor. Nothing is happening beyond lip service. Boston will not expand in the next 15 years, and that’s a GOOD thing. Boston needs to strengthen its existing system, cut down the debt, and manage with what it has. If Baker is trying to reduce the debt, why is he not canceling SSX and SCR? Yep. It’s 100% the Big Dig. The problem is that this is pure optics – the difficult parts of the Big Dig excavation were already done for NSRL as well, so if NSRL is built now, it’ll have clear dirt to go through, and relatively easy station building thanks to the planned use of large-diameter tunneling machines. It looks a lot scarier than it actually is. SCR is currently estimated at $3 billion for 4,500 weekday riders. Cut the budget by a factor of ten and it’s still bad transit. The various attempts to do it for somewhat cheaper, zigzagging via the Old Colony Lines, make it so circuitous as to be slower than buses are today. Treating the attempts to save money there as equivalent to the attempts to do the same on the 52,000-rider GLX is exactly the kind of performative fiscal conservatism I’m accusing Baker of. As for the NSRL feasibility study: the RFP went out as this article went to press. But this was after years of stalling by Baker, refusing to look into the project on the grounds that it was unaffordable. He explicitly proposed doing SSX first and then NSRL. Nor is NSRL Boston-focused. To the contrary, the biggest beneficiaries would be suburban commuters on the North Side lines. By analogy, the East Side Access tunnel is being dug in New York, but the benefits accrue to Long Islanders, and in the late 1990s and early 2000s, the political champion of the project was Governor George Pataki, who was appealing to his suburban base; the city didn’t care about the project, and city-based Assembly Speaker Sheldon Silver championed Second Avenue Subway instead. Even the sort of operational improvements we call for at TransitMatters – TOD, high frequency, fare integration, infill stops – don’t change the fact that most commuter rail benefits go to the suburbs. NSRL specifically would connect the North Side suburbs to the CBD, where today they have to transfer at North Station since it’s too far north of the CBD. Electrification would also boost speeds for suburban commuters. It would help Dorchester because of Fairmount Line improvements, but it would also help Newton, Wellesley, Mansfield, Attleboro, Plymouth, Bridgewater, Salem, Lowell, Winchester, Lynn, Framingham, Norwood, Waltham, Reading, and Haverhill. The story is that Baker is not going after $5 billion in wasteful spending on SSX and SCR but for years stalled on a $6 billion project with infinitely more benefits than SSX and SCR. As for Paris and diesel fumes, I’ll be very happy to discuss the policies the city is undertaking to end this scourge. These include highway removal, free transit on bad air days, continued investment in the Metro (not so much the RER, and this is a mistake on Paris’s part), and an upcoming ban on all diesel cars from entering the city. I am not actually debating the merits of the projects, but your representations of them. The NSRL study was in the capital plan approved in June. Discussions with the working group have been underway for months. There is little to no funding for SSX nor to construct SCR, so it’s not like there is a budget to cut that would then free up money for the NSRL. The premise that the Governor is taking a position on NSRL to look good is off base, in my opinion, but you are entitled to yours. But that is secondary to the facts about these projects. Hear hear. Baker implemented a good strategy across the board. He knew his DOT pick, Stephanie Pollack, would scream 24/7 about transportation from her Dukakis computer, so why not make her a token pick without power. The Dukakis camp is quelled, and Baker can move a conservative agenda. Obviously you didn’t do the research. Focus on Paris buddy. It’s criminal that this wasn’t built as part of the Big Dig. Hadn’t known about the clearing of the ROW below the highway tunnel though–at least all’s not lost. I could be wrong but I see it as a generational issue. You have the old Boston Globe writers – Dan Shaughnessy, Bob Ryan – seeing NSRL as a fanciful frivolity that would “divert” funds from “investing” in drivers’ commutes. (Which the big dig spent $15 billion on). This is absurd, but I’m not sure whether baby boomers who don’t take transit really understand the importance of NSRL. London with Crossrail is a better analogue than Paris in my opinion. Governor Charlie Baker has done an excellent job. Sound and solvent fiscal review as the Dukakis debt mountain starts to rear its ugly head. Dukakis left Baker $26 Billion in Big Dig debt: some of it due to poorly planned transit mitigation assurances: the biggest one being North South rail. Are you kidding me? Have you ever worked in transportation or politics before? Thank you for writing into this post John, Alon has dug up a topic and a framing that really deserves the expert scrutiny your providing. While the SCR isn’t funded (fiscally unconstrained? ), it is taking a place in line and receiving political attention to get funding that, per Alon, it clearly will never warrant. To me, that in itself to me seems problematic. Yes, that is the baby boomer argument I remember reading against rail in the Globe 20 years ago. It isn’t a baby boomer argument, it’s a realistic argument. If Portland, Maine grew to the same size as Boston, so roughly 600,000 today, then I would be with you in unison about building the N-S Link. But Portland, ME isn’t 600,000, its 60,000. Boston eclipses any and all urban centers to it’s north and east by sixfold. It’s the last major urban center within the Northeast Corridor, there’s no need for the N-S.
Philly is a terrible example. They built the crosstown rail, but didn’t have enough money to electrify the system, leading to force consolidation. If the Big Dig hadn’t been built, SEPTA modernization would today stand as the biggest transportation boon-doggle in the US. Passengers can easily get off at North Station, take the one seat Orange Line ride to Back Bay, and connect to nearly every CR/AMTRAK route. Other links tie the Old Colony CR (JFK) to other lines (Porter, etc.) via one side subway rides. Your diagram is moot. NSRL, SCR, SSX, GLX, all of them are half-baked, all of them are unrealistic. The GLX, even if trimmed to the realistic Phase 2, is not worth it. Boston CR is being cut across the board, hundred are being laid off, and the handicap no longer have services, but the state has $2 billion for a trolley line in a trench? Trump can hold up his side of the bargain for years, dangling a carrot, and then taking it back until Mass enforces his sanctuary city legislation. I rather the state focus on more important issues, like the existing system. If and only if a project has a private backer should the FMCB say yes. Interesting. Would you be swayed by this argument in favor of severing I-93? SEPTA’s non-electrified diesel lines contributed a rounding-error level of ridership in the 1980s compared to the extant electric network. Its lack of continuing subsidy to operate was out of SEPTA’s hands, residing with the state. Before the tunnel, passengers also could have easily used the Market St subway to transfer to the other RR side, but that didn’t preclude the demand for a one-seat connection without forced transfers, which are highly crowded, hectic, and undesirable no matter how optimized the connection. Moreover, the total tunneling cost only ran up to about $800 million in 2017 dollars for 2.7 km, which is as cheap as it gets when needing to underpin skyscrapers and reroute multiple tunnels. I merely talked about the passenger-side aspect to through-running, but the operational benefits are perhaps even more immense. SEPTA has a practically unlimited amount of capacity to shove as many peak-hour trains through as warranted, only requiring relatively cheap yard space in the outer suburbs. The T has to spend billions on SSX, carving out layover yards on precious downtown land to increase capacity marginally. Now which investment seems like the wiser choice? Geez, Maggie. Brush up on your Boston knowledge before commenting. The city successful stopped the massive highway cut-through equivalent to North-South. It was called I-95 through Boston. I-93 is bad, but nothing compared to what could have happened. Oh great. For a second there I thought the city had a 6 lane interstate highway running through it, while someone was telling me that thru-transportation was unnecessary because Portland’s population and Maine villages. What an incredible relief. My Boston knowledge is based on 10 years in the city before leaving for a place that was more transit friendly. I’m only commenting as someone who lived there, got a good education there, and then chose to leave. Gee Santos – I guess Bill Weld never existed, and I guess his and Baker’s mismanagement of the Big Dig never happened. Must have been a dream…. He canceled the Red Line, which would serve predominantly black Baltimore neighborhoods, but not the Purple Line, which will serve a whiter, more affluent population but is not demonstrably more cost-effective.